Charged with building a new fleet of airships to traverse the Oniverse, you must draft the best blueprints, acquire materials, and recruit a crew to build the most wondrous fleet ever seen. You are an air-shipwright, that is, an inventor of flying machines used by the dreams to traverse the skies of the Oniverse. The Archonts have given you a weighty charge: to build a new fleet, more beautiful than any that has ever sailed the skies. As a master air-shipwright, you have the skills to build a fleet to traverse the skies of the Oniverse, but you must proceed carefully to gather the components you need. 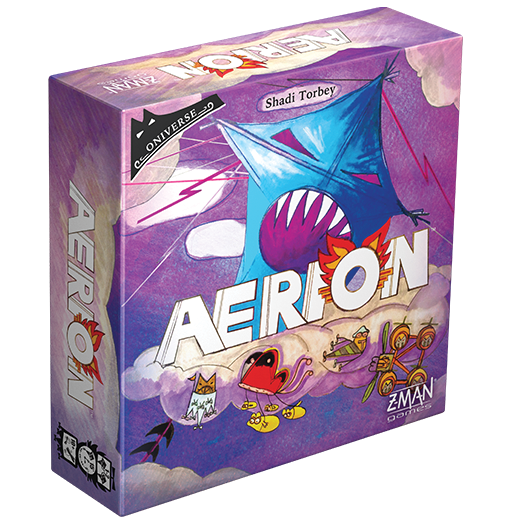 In Aerion, one to two players work together to build six airships. Draft the best blueprints, acquire the finest construction materials, and recruit the most skilled crew. Can you build the fleet before your resources run out? Six included expansions will alter your journey through the skies and offer new challenges to complete. Each expansion adds new cards and gameplay that can be played independently or freely combined. Use new abilities from the Factory cards to complete your most critical task in the Flagship expansion. Race against time with the Hourglasses. Or destroy Outposts and Lairs to defeat the marauding Hellkite.